Three aliens upend ordinary lives when they possess human bodies in preparation for invading Earth. An alien lifeforce possesses schoolgirl Akira Tachibana. Akira dismembers her family and causes a major traffic accident, seeding her new desire for destructive behavior. Another alien possesses Shinji ‘Shinzy’ Kase, although he behaves like an elderly amnesiac who is unfamiliar with his body. With their marriage already troubled, Shinji’s wife Narumi is additionally burdened by having to care for her transformed husband as though he were a confused child. Weekly World reporter Sakurai receives an assignment to cover the Tachibana murders. At Akira’s house, Sakurai meets teenager Amano, the third possessed person, who is searching for Akira. Amano explains that he is part of an alien race preparing to invade Earth and asks Sakurai to be his guide. Disbelieving the boy but sensing a story, Sakurai agrees. Shinji asks Narumi’s younger sister Asumi to explain the concept of ‘family’ to him. Shinji touches Asumi’s forehead, causing her to collapse. When she recovers, Asumi rushes out of the house after behaving as though distanced from her sister. Sakurai goes to Amano’s house and finds the boy’s family in a state of catatonia. Amano explains that the aliens are collecting conceptions to learn about humanity. When they acquire a person’s comprehension of a concept, the person loses his/her understanding of that idea. Narumi’s boss Suzuki gives her a coveted illustration assignment. Suzuki tries massaging Narumi’s shoulders, but she rejects his unwanted advance, which draws his ire. Exploring the neighborhood on foot, Shinji comes across a man named Maruo working outside his house. Shinji says he wants to live in the man’s home. He asks Maruo to envision the concept of ownership or possession. After taking the concept from Maruo, Shinji realizes the residence isn’t his. Freed from his attachment to the house, Maruo praises Shinji for curing him of his reclusiveness. Sakurai and Amano find the hospital where Akira is being held by police for observation. Following a fight, Akira takes the concept of ‘self’ from Detective Kurumada, who momentarily collapses. Sakurai leaves in his van with Amano and Akira. Akira mentions the possessed bodies she destroyed before eventually transferring into the schoolgirl. Sakurai comes to believe the teens really are aliens and asks if he can write about their planned invasion. Akira explains that they need Sakurai’s help to obtain parts for building a transmitter. Akira and Amano also need his help to find the third alien. Shinji shows up unexpectedly at Narumi’s office and takes the concept of ‘work’ from her boss. Suzuki becomes childishly playful. With Narumi confused over what transpired, Shinji tells her he is an alien. He adds that the original Shinji is dormant and he is developing a new personality. Shinji explains the conception collection process and admits that he took ‘family’ from Narumi’s sister. Claiming to be from the Health Ministry, Shinagawa tracks down Sakurai while the reporter purchases parts for Akira’s transmitter. Shinagawa claims that Akira has contracted a new virus and he needs Sakurai’s help to contain it. Shinagawa gives Sakurai a device for contacting him. As SDF military soldiers filter into the city, Sakurai notices astrophysicist Dr. Yoshikawa in one of the envoys, confirming his suspicion that the alien threat is real. Converted by his experience with Shinji, Maruo tries rallying citizens in a public square. Maruo spots Shinji and Narumi watching him. Maruo asks what Shinji did to change him, but Shinji does not answer. Sakurai observes their interchange. Sakurai tells the two teens that he found the third alien. Amano explains that when the three aliens are united, they will pool their collective understanding of humans, use the communicator, and begin the invasion to exterminate mankind. Sakurai warns that humanity will fight back. He asks if it is possible for both species to coexist. Amano says some humans may be kept as samples for study. Two police officers locate Akira as she looks for wire outside their hideout. Akira executes both officers. Sakurai angrily warns that Akira cannot kill without consequences. Shinagawa’s men chase Shinji and Narumi. The men are frightened away when Shinji begins taking conceptions from them. Narumi and Shinji have a bonding moment as Narumi starts seeing her transformed husband with new understanding. The couple stops in a church. Shinji tries taking the concept of ‘love’ from a pastor, but is unable to. Narumi explains it is because love is impossible to picture clearly as a universal idea. Akira kills several of Shinagawa’s men. She and Amano realize that they were located through the GPS transmitter Shinagawa gave to Sakurai. Sakurai realizes Shinagawa manipulated him. A doctor calls to inform Narumi that her husband may be suffering from a new virus. The doctor has Narumi bring Shinji to the hospital, where numerous patients wait to be examined while others begin losing their minds. Realizing her husband really is an alien, Narumi flees with Shinji when Shinagawa shows up at the hospital with armed soldiers. Sakurai greets Narumi when she returns home to pack a suitcase for going on the run with Shinji. Sakurai explains he is an alien guide like her. Sakurai warns that Narumi cannot let Shinji come in contact with the other two aliens or else the invasion will begin, which Shinji never told her about. Akira and Amano arrive at the Kase residence. The three aliens have a telepathic conference. Narumi then escorts her husband to their car and drives away. Shinji says the invasion will begin after the communicator is constructed. Feeling misled, Narumi counters that their relationship would never work. Shinji proposes a fresh start for he and Narumi. She worries it is too late for them. When Sakurai, Amano, and Akira track them down, Narumi speeds away once more. Narumi unintentionally runs over Akira as Akira attempts to block the road. Amano asks Akira if she wants to transfer to a new body. Akira refuses and hands Amano the communicator activation device before dying. Sakurai tries warning nearby pedestrians of the alien invasion. When no one listens, Sakurai resigns to reteaming with Amano. Sakurai asks if the offer still stands to become a sample human. Amano and Sakurai set up the communications array. Shinagawa’s crew finds the two of them. Amano takes conceptions from Shinagawa, prompting the other men to shoot Amano. Amano reveals an Uzi and guns down everyone except for Shinagawa. Amano collapses from his gunshot wounds. Sakurai offers his body as a vessel. Amano instead passes the communicator activation unit to Sakurai before dying. Sakurai activates the communicator. He then gets into a firefight with a military plane before its missiles finally obliterate him. Narumi and Shinji discuss the impending invasion. Narumi asks Shinji to strangle her, but he cannot go through with the act. The couple holds each other. Narumi tells Shinji to take ‘love’ from her so he can become the real Shinji and go home understanding humans. Shinji takes Narumi’s understanding of love. Shinji is left feeling incredible while Narumi claims to not feel any different. The couple goes to a cliff where they watch the invasion begin. Two Months Later – Shinji arrives at a triage unit where a doctor mentions how the invasion was previously called off. Shinji theorizes that coming to Earth made the aliens wiser, as they now try to treat humanity’s problems. The doctor adds that Narumi’s case is unique. Shinji visits his wife in an area where she sits alone with a vacant expression. Shinji promises to always be with Narumi until the end. Teenage boy Amano hasn’t been himself lately. Neither has Shinji, whose persistently put-upon wife Narumi now fumbles with a husband inexplicably behaving like a geriatric amnesiac. Not far away, sweet schoolgirl Akira went to the store for a goldfish. She instead came home possessed by a presence that went on to dismember her mother. Not out of malice, mind you. Out of curiosity. You see, Amano, Shinji, and Akira compose the first contact team of an alien race preparing to invade Earth. Before annihilating humanity however, they first have to understand it. To do so, the three body-snatched beings assimilate concepts such as family, ownership, work, and love from those whom they come in contact with. The downside, for anyone unfortunate enough to mistakenly engage them anyway, is that those ideas permanently leave the other person’s comprehension. In the mix with the two men and two women mentioned is tabloid reporter Sakurai, who regularly wrestles over his role in the invasion plan. Meanwhile, a government agent works to dismantle the threat by slightly surreptitious means. As personalities change, exchange, or encounter enlightenment, everyone involved confronts an identity crisis that is alien to humans and interstellar beings alike. “Before We Vanish” isn’t quite as quirky as it probably sounds. Director and co-writer Kiyoshi Kurosawa made a mark with dark thrillers including “The Cure,” “Pulse,” and “Creepy,” although he has also firmly stamped his foot in family drama and comedy across his 40+ film career. Kurosawa’s flair for horror flashes in setups such as Akira’s bloody abode. Music occasionally adds a tinge of madcap mirth to blackly comic moods. More than anything though, Kurosawa’s amalgamated mix of free-spirited romp, grounded introspection, and subtle sci-fi presents “Before We Vanish” as a food-for-thought film rooted in a surprisingly down-to-earth experience. Silliness swaths certain characters while harrumphing humor peppers some scenes, yet the story remains steeped in sincerity. Most of the moments featuring Uzi assaults or other energetic actions, of which there aren’t many, mainly serve as smokescreens. Narumi’s ongoing struggle to relate to her transformed husband, as well as Sakurai’s reconciliation of his real purpose, fill the movie’s true center. Their threads pull tone back when it risks unraveling into inconsistent absurdity. 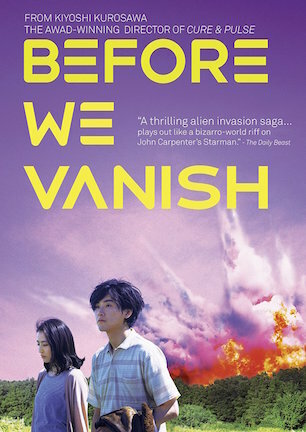 By the time romantic comedy misunderstandings and machinations of mysterious conspiracies play out their beats, “Before We Vanish” leaves its audience with questions concerning the human condition it had no intention of directly answering. That’s both the beauty and the bother of the film. Each actor in the primary quintet engages by way of performance as well as personality. Their relatable natures, even the alien ones, run each role through a gauntlet of self-doubt, selfishness, courage, cowardice, fluctuating convictions, and every emotional state that can fit in between. Their collective capacity to convey chameleon complexities fascinates outwardly as modestly extraordinary fiction, but more importantly, inwardly as a reflection of ordinary existence. Divots on that green come from the storytelling style’s overly ambling approach. “Before We Vanish” finds components for constructing its core as it goes along, figuring out what it wants to say before understanding how to say it. Without doubling back to excise fat, the runtime bloats to a rotund two hour and ten minute total. Attention spans really start succumbing to malnourishment down the backstretch, ironically when momentum hits a high point. There couldn’t be a more unfortunate time for a chugging rhythm to take its toll too. For all of the opportunities spent flirting with explosiveness or cynicism-inspired laughter, “Before We Vanish” winds down to a peacefully pondered conclusion. Yet the roundabout route to this sensitive sentiment makes so many sedentary stops along the way, many passengers may physically or mentally depart before caring to dissect the main message. I can’t tell if I’ve compartmentalized the movie correctly or offered a fair summation of its substance. “Before We Vanish” is a unique motion picture built by atypical characteristics determined to bounce away from convention. Should I need to attach one more advisement, know that the subject matter may suggest something more fantastic than the movie means to be. It meanders too much to earn universal appeal, though those looking past its love handles can find an intriguingly offbeat experience they most likely were not expecting.